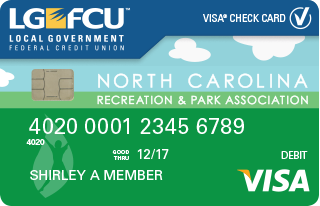 The NCRPA Visa® Check Card was created exclusively for volunteers and employees of parks and recreation departments across North Carolina. It’s our way of helping NCRPA generate funds to benefit communities across the state. Each time you use your NCRPA Visa® Check Card, LGFCU donates 50 percent of its share of the net merchant's fee directly to programs sponsored by NCRPA. Money generated by using the debit card helps fund scholarships and professional development opportunities for NCRPA members, marketing efforts for the profession, and local community projects. This debit card can be used at the nearly 1,100 CashPoints® ATMs across the state or anywhere you see the Visa logo displayed worldwide. There are many ways you can generate funds for the North Carolina Recreation and Park Association, just by making everyday purchases! There is no charge to order the card and no purchase fees. Plus the LGFCU Checking Account has no minimum balance and a low monthly maintenance fee of just $1. Set up alerts for your NCRPA card through Member Connect. You can monitor purchases in near real-time and identify questionable transactions sooner. The Credit Union's debit card alert program allows you to receive notifications on your cell phone, keeping you up-to-date*. 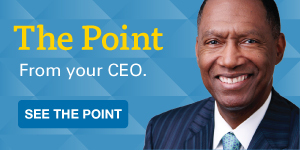 Not an LGFCU member? Not a problem! Just download this voucher and bring it with $25 to your nearest branch to open a Share Account. This dividend-earning savings account is the foundation of your membership. To get your NCRPA debit card, open a no-minimum balance Checking Account, too! Support a cause that matters to you. Get your card today! Join LGFCU if you’re not already a member. *Data and text messaging fees may apply; please check with your service provider.